Ebenezer Obey On The Town! 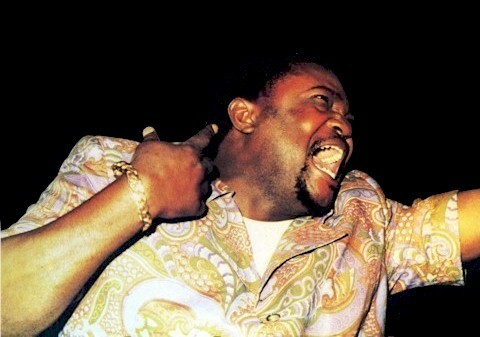 Why I'm an "Ebenezer Man"
"In the early 1970s TPOK Jazz was actually two orchestras, one based in Brussels and led by Franco and a second team helmed by Lutumba Ndomamuendo or "Simarro," which stayed in Kinshasa." Yes, during the tour of 1983/84 the OK Jazz band that Franco took to Europe (and the US) was based in Brussels but only for about a year. They didn't live there, they just stayed there for the duration of the tour. As for "Exodus", I don't think it was written by Simaro & performed by OK Jazz. I think it's a Youlou Mabiala track from the late 1970s. Yes, you're correct about the two bands (I've corrected that in the post). As to "Exodus," I no longer have the original 45, but I'm pretty sure the credits are as I indicate. I wrote down all the information when I dubbed the record 20 years ago. . . .Not that you're wrong that "Exodus" could be by Youlou Mabiala. It could very well be, but issued in Kenya under the TPOK Jazz name. Stranger things have happened! Thanks for the excellent post John. Yes, that's what I meant, it was issued under the OK Jazz name. Anyway, ASL 2271 would mean the single was released in 1981. Although Youlou did record with OK Jazz that same year (the excellent "Mwana Bitendi" LP), "Exodus" sounds different, more like early Orch. Kamikaze. very nice post! Thanks for the tunes. Thanks for the great info. and music! I stumbled upon your blog and its purpose seems to have worked-- I want to check out Franco and OK Jazz now. I thank you very very much for this post and tune. I'm from RD Congo and I discover again how much Zairan/Congolese Music is rich. I am very proud of it.